A special photographic film with a sensitive emulsion layer that blackens in response to the light from intensifying screens. The emulsion has silver halide crystals immersed in gelatin. 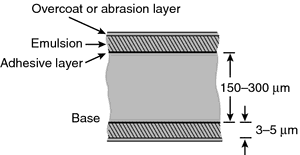 Single-emulsion film has the emulsion on one side of the cellulose base. It is used for digital, mammographic, and extremity imaging, in which high detail is necessary. Duplitized film has the emulsion on both sides of the cellulose base. It is used for general-purpose radiological studies. The bitewing X-ray film holder consists of two planes, a film-holding plane and a bite plane. This increase in efficiency enabled a substantial reduction in x-ray exposure levels without compromising image quality, and x-ray film manufacturers moved quickly to develop x-ray film that was sensitized to green light. Moreover, the costs and retrieval difficulties inherent with X-ray film are eliminated. Is the end of x-rays near? Production of X-ray film consumes as much as one-fifth of all silver consumed by industry worldwide. Historically, mammograms have been conducted using medical x-ray film. Fuji's family of Imaging Systems products and technologies--including digital x-ray, women's healthcare imaging, dry imagers, and conventional x-ray film and equipment--are tailored to suit many different applications for a variety of imaging environments. Contract awarded for preventive maintenance image processor for x-ray film . Digital panoramics are advantageous large-format images of the patient's teeth, jaw, and surrounding bone structure for a more complete analysis and diagnosis, without the use of x-ray film. Its portfolio includes picture archiving and communications systems (PACS), radiology information systems (RIS), IT solutions, clinical information solutions, computed and digital radiography systems, laser imagers, mammography and oncology systems, x-ray film systems, and dental imaging products.